Demo Day took place on a rainy Saturday evening and brought about 400 attendees. Before and after the pitch, reporters and investors had the opportunity to speak to each of the companies in person and look at displays and prototypes. 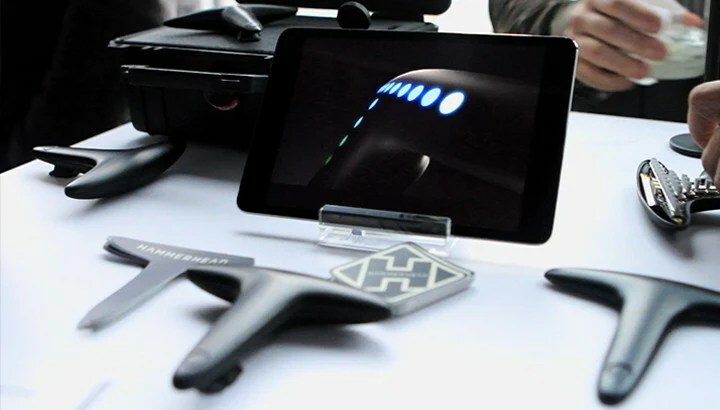 As you know, we decided as a company to bring our full team to Texas to share this significant milestone together, and the extra manpower proved to be indispensable in handling all the interest from the large crowd that formed around the Hammerhead display. Afterwards, almost every team was represented at the Omni Hotel pool, sharing in good times until a very late night became a very early morning. Never have so many people tried to fit into a single hot tub. As we made the most of the last moments of this incredible journey together, it was difficult not to reflect on what a wild experience the R/GA Accelerator has been. Our adventure to SXSW closed as it began – with a lengthy road trip in what’s become known as the Hammerbus, our 12-seater rental van. Returning through the dramatic landscapes of the Southwest with the satisfaction and confidence of having successfully executed our goals was extremely memorable. After one final night in New Orleans, we said goodbye to the South and returned home. There is a growing sense that one chapter of our journey as a company is over. We are excited to the tackle the challenges that the next will bring and look forward to sharing the experience with you. The weeks are flying by with barely a moment to take a breath, and we’re about ready to ship off tomorrow evening for our big Demo Day at SxSW in Austin, Texas. Piet and Jon have been practicing non-stop for what we’re confident is going to be an awesome presentation – and we’re thrilled to be sharing the stage with our friends and associates from the 8 other incredible R/GA Techstars Accelerator companies. With this trip, our time here at the Accelerator draws to a close. This represents the end of another challenging but immensely rewarding chapter of our journey. Although we are looking forward to a day or two of catching up on our sleep, we find ourselves reflecting on all the progress we have made here over the last 4 months. We not only forged ahead with our product, but have created a group of friends here and can say with confidence that the hardware startup tribe of NYC is fired up and ready for a good summer! As with any significant endeavor we have faced significant trials but our commitment to this product and to each other have held constant. We love working together, and we can’t wait for this upcoming summer, with its promise of bikes, sunshine, and good times spent with the people who have supported us thus far. We have a grand adventure ahead of us this week as we travel across the United States with our whole team – and we’re looking forward to bringing all of you along for the ride with us, with blog posts, email updates and video. Be sure to keep an eye on our twitter page, as we’ll be updating it constantly. For our team, this journey to Austin is symbolic of the physical transition ahead as we say goodbye to R/GA and Techstars and grow to new heights as a company. Well, Austin awaits! We can’t wait to share this next week’s excitement with you! Hello backers (and new customers)! Raveen here. We are excited to announce that today we opened our site up to orders through bitcoin. As you likely know, bitcoin is rapidly becoming a go-to online currency. It seems that every few months there is an explosion of news about this currency, always attempting to make sense of what it means for the global financial system and for law enforcement. Our move to accept it is a small one, admittedly, but to us it evidences our commitment to navigating the ever-shifting sands of emerging tech. Further, we want to be a part of the community that shifts bitcoin’s public perception away from use for nefarious deeds. Bitcoin has been on my radar for a long while, and it was exciting to see it emerge on the international stage in 2012. There’s something delightfully old-world about a digital currency that acts – at least in part – like cash. To me, bitcoin is a store of value, pure and simple. I like to think of it as having a little pot of gold hiding inside my computer. I’m also excited by the ideas that serve as the foundation for this currency, and the way it makes one think about principles of value and money. There is a misconception, drawn from the same fear of sites like the Silk Road (which, to my eye, was a good deal more useful than its public reputation suggests), that bitcoin is an untraceable, unethical currency – one destined for the back-alley deals of 21st century criminal enterprise. Certainly, it can and has been used towards those ends. And yes, it is more anonymous than using a credit card. But it is an innovation – and in my mind innovations shouldn’t be judged by the actions the worst of us would carry out with them. All to say, bitcoin is modern and high tech, and we are a fast-moving, forward thinking startup. This is a match made in heaven. We want to explore the bitcoin option and allow our customers to make use of this exciting new medium of exchange. It’s a learning experience for us, to be sure, but we are excited to take it on. Use bitcoin or any other currency to order a Hammerhead here. We have now got our pre orders running smoothly here. We are excited to keep the ball rolling forward on growing our community and accepting pre-orders for our second batch of Hammerheads that will ship in June of 2014. These units will be the same as those ordered in the crowd funding campaign, but they will not have the same level of discount. They will also not have the lifetime “elite status” within our app that we reserved specifically for our first backers that came on board during the campaign. We have been amazed to have had a really steady rate of orders despite the relative calm that has replaced the crazyness of the campaign. We have been able to identify facebook as a tremendous source of new customers for us, which speaks to its power as a medium through which great products might be shared. It also confirms to us how passionate our supporters that have already come on board have been in sharing Hammerhead with their friends. To all of you, thank you! We are working on adding additional payment methods to our site and will soon be able to accept PayPal as well as Amex. This will help out many people who have requested these as payment methods. Stay tuned for more on this process!